While Roll-Up Cake Doesn’t Sound Fancy, This Delicious Dessert Is Perfectly Elegant! If you need a showstopper to round off your meal, this roulade is it. This light and refreshing dessert is ideal for for special occasions, and don’t be surprised to get rave reviews from friends and family after you place this gorgeous dish in front of them – it is stunning! You may have to plan ahead, but this delicious dessert is definitely worth the extra effort. Whether it’s for a birthday or anniversary, or if you just feel like stepping things up a notch in the kitchen, you won’t be disappointed when you tried this out! Preheat oven to 350º F. Butter a large cake pan and line it with parchment paper, then grease parchment paper with butter. In a separate bowl, beat eggs until lightened in color and very thick, about 5 minutes. Add vanilla and sugar, and beat until combined. Gently fold flour mixture into the eggs, then mix at low speed until just incorporated. Pour batter into greased pan, smoothing over the top, then place in oven and bake for 20 minutes, or until golden brown. Remove cake from oven, run a knife around the edges to loosen it from the pan, and let cool 5 minutes. Generously dust a clean dish towel with powdered sugar, then quickly flip sugared side onto the cake pan. Carefully invert cake pan onto the dish towel. Gently roll the warm cake up and set aside to cool. Sift powdered sugar into mascarpone and whisk together to combine. In a large bowl or mixer, whip heavy cream until stiff peaks form. Fold cream into mascarpone mixture, then fold berries into the cream. 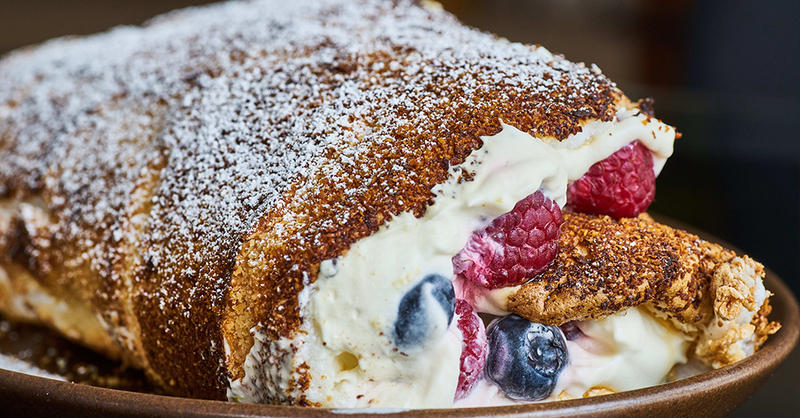 Carefully unroll cake, and spread mascarpone and berry mixture evenly over the inside . Re-roll cake around the filling, ending with seam side facing down. Refrigerate until ready to serve, and dust with powdered sugar before serving.